OTTAWA — The minister of democratic reform suggested Tuesday he sees no need for a Conservative backbencher's bill that proposes to limit the powers of the prime minister and other party leaders. 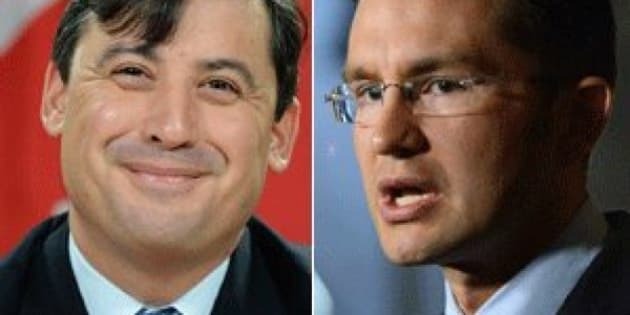 In an interview with The Huffington Post Canada, Pierre Poilievre said he hadn't seen MP Michael Chong's bill and wouldn't comment directly on it. But the minister indicated that the problems it aims to fix — liberating MPs from the stranglehold of party leaders — do not exist in the Tory caucus. "Members of Parliament play an essential role — it's voting on behalf of their constituents in the House of Commons," Poilievre told HuffPost. "The Conservative caucus votes far more freely and independently than any other caucus on Parliament Hill," he said. "We do not suffer from the iron-clad centralized control of the NDP." Chong's bill, the Reform Act, was tabled Tuesday and would empower the party caucus to call for a leadership review and boot out an unpopular leader by a simple majority vote. The bill would also give caucus the right to vote out members of the group, a power held only by party leaders at the moment. Finally, it would take away a party leader's power to approve and veto candidates and give the final say to the riding associations. Chong said power had been transferred from the elected House of Commons to the Prime Minister's Office in an unhealthy fashion in recent decades. "This bill would restore balance by empowering the House of Commons to play a bigger role in the decision that take place in Ottawa," he said. Most of the proposals Chong put forward, however, deal with the way political party caucuses run their internal affairs. Conservative MPs may not like the fact Prime Minister Stephen Harper hasn't had a leadership review since 2005, but the party's rules allow it. Similarly, Chong's bill would also give MPs the right to pick their own caucus chair — the person who represents their views to the leader. The NDP and Liberals say their MPs already vote freely to pick their chairs and it's only Harper who controls his party's caucus chair. However, Poilievre told HuffPost he thinks the Tory caucus "has a very strong voice." He pointed to a study that found Conservative MPs were far more likely to break rank and vote against the wishes of their party's whip than members of other political parties. "I think the opposition parties, particularly the NDP, probably should have more voice," Poilievre said. "I can’t even remember the last time the NDP had a free vote. The only guy who voted against the NDP is kicked out of the caucus because he opposed the gun registry." Rajotte, the chair of the Finance committee, said Chong's bill fixes "longstanding issue that needs to be addressed." He noted that if caucus voted to remove a leader, the party's membership might still vote and reaffirm support in the leader, forcing him or her to get along with the Parliamentary team. Poilievre said Harper had already brought several reforms to the chamber. "If you look at this prime minister, he has done more to transfer power to the population and to the democratically elected parliamentarians than any prime minister in modern memory," he said. Poilievre said Harper is the only prime minister in history to allow the provinces to elect Senators to be recommended for appointment. The Conservative leader also reinstated the practice of mandatory parliamentary votes before committing soldiers to combat and allowed MPs to question Supreme Court appointments, he said. "These are previously held executive powers that previous prime ministers have jealously guarded for themselves. And they are powers that Prime Minister Harper has shared with Parliament and with the people of Canada," Poilievre added. He wouldn't say whether the government intended give Conservative MPs a free vote on Chong's bill but said he looked forward to the caucus discussions. NDP Leader Thomas Mulcair and Liberal Leader Justin Trudeau both announced they would allow their MPs a free vote.